While Hua Hin still remains a royal and high society favorite, this traditional Thai resort has developed many golf courses over recent years, combining the new attractions of a modern golf holiday destination with local charm. Unlike some of Thailand’s other golf resorts, Hua Hin has avoided the hectic tourist development and the town maintains an old world character. 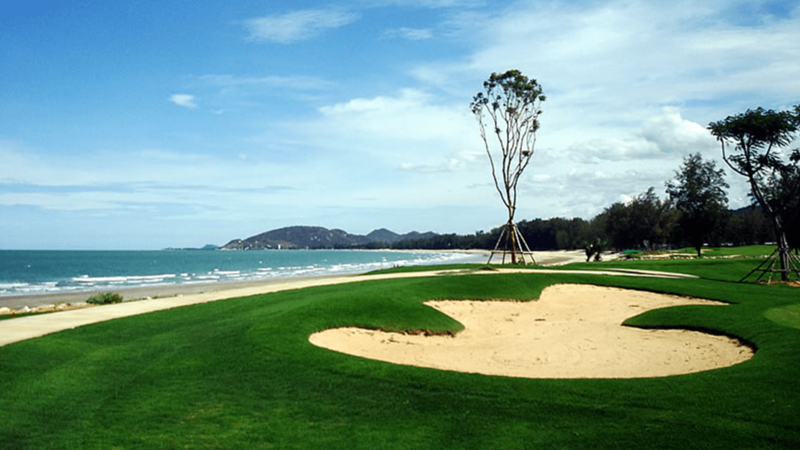 It’s a place to golf, relax, take a stroll, eat great seafood and enjoy the unique experience of golfing in Thailand. Banyan Golf Club Hua Hin is an outstanding golf courses whichThe course was designed by a local architect he has made use of the natural surroundings and the pineapple plantations which surround the course often come into play. The course has been built on the site of a former pineapple plantation very close to the centre of Hua Hin with great views towards the mountains of Burma and occasional glimpses of the Gulf of Thailand. The course has been set up to appeal to golfers of all standards with a choice of six tee boxes. The Zoysia grassed fairways are usually in immaculate condition and the TifEagle Bermudagrass used on the greens means that they run fast and true. The contemporary Thai-style clubhouse features luxurious changing rooms and with some accommodation. The course has won numerous awards including recognition by Asian Golf Monthly and also featured in the Rolex list of the Top 1000 golf courses in the World. The Imperial Lake View Resort Golf Club is one of the most scenic golf courses in Hua Hin and is located in the foothills not far from Kaeng Krachan National Park so you’re guaranteed some beautiful scenery. Originally there were two 9-hole layouts: Mountain A and Lake B; later two additional nines one is a desert style course which is unusual and the fourth is predictably based on Scottish links with lots of open space and is the easier of the four nines. The main A to B courses at Imperial Lake View are bisected by a lake, and the streams that supplies the lake runs alongside many of the holes. There are some mature fully grown trees here with some challenging dog-legs and the odd blind shot, with holes that leave you wondering how to make par regardless of what your handicap is. These difficult holes are balanced by some easier ones so you at least you get some relief along the way. The desert nine requires careful management and is arguably one of the best 9 holes in the area. The short 4th for example will test your skill, it contains a stream running along the fairway and some rocky outcrops that could easily swallow your ball. Majestic Creek Golf Club and Resort is a 27 hole gem, lying in the beautiful undulating countryside close to the mountains separating Myanmar from Thailand and only 25 minutes outside the Royal town of Hua Hin. Three 9 hole layouts, “A” course, (Creek Course) 3,638 yards from the back tees is a beautiful challenging 9 holes, with water coming into play on 4 holes, immaculate greens of Tiff Eagle Superdwarf (all three courses now have this type of putting surface). The fairways are Zoysia on all courses and are in excellent condition throughout the year. Course “B”, (Lake Course) 3,715 yards from the back tees, must be played strategically, with many tricky holes to negotiate. Course, “C” (Waterfall Course) 3,491 yards, nestles close to the mountains and is a dream to play, with water coming into play on 6 of the holes, if you can avoid the water you can have a great score. A new tee box has recently been installed on the Signature 5th Hole above the waterfall giving you a fantastic view of the whole course. There are 4 tee boxes on all three courses, Ladies, Seniors, Men, and Professional, all of which offer a great and fair challenge to all levels of golfers. Milford Golf Club in peaceful Hua Hin is surrounded on three sides by forested hills with its fourth side fronting the Gulf of Thailand. From the clubhouse you can enjoy panoramic sea views that give this Hua Hin golf course a bit of a links atmosphere. Large variations in elevation allow for variety in playing up and down sweeping fairways and approaches. Hole 18 is a lovely finishing hole played from an elevated tee that demands a shot of 200 yards carry to reach the fairway. Located 40 minutes south of Hua Hin, this Hua Hin golf course designed by Robert McFarland in 1994, has beautiful scenery everywhere you look, from the forested hillsides to the crystalline seascapes. It’s 6,614 yards are built between two rocky peaks adjacent to the beach, where it plays more like two separate nine-hole courses, one quite demanding with challenging tee-shots, and the other relatively easy. The course was designed by golf course architect, Max Wexler, and the layout has an east to west position with lakes at either end which are separated by a large clubhouse and rocky mountain outcrop. The course is lined by hundreds of trees and enjoys lots of slight elevations, which means the course is aptly named. The beauty of the thousands of frangipani trees and bougainvillea shrubs gives the course a truly natural feel that is very conducive to a round of golf when on holiday in the region. The back-9-holes enjoy a spectacular view of the surrounding mountains and immense view looking out across the distant Gulf of Thailand. The course is not as taxing as some of the other courses in the region, which makes it a great course for those looking for an enjoyable round of golf. The fairways are made from Bermuda Grass and are very wide and forgiving. However, the course does have bunkers and lots of water hazards, courtesy of the surrounding lakes. One thing you have to remember though is that the greens at Palm Hills are some of the fastest in the region, especially if you are putting with the grain. The Royal Hua Hin has a distinguished history dating back to the early half of the 20th century making it the oldest golf course in Thailand. It’s not in great condition but still very playable. The course wanders between the rocky outcrops and has been designed to mould with the natural terrain and is reminiscent of many of the older British courses. Due to its long history, the course is lined with fully mature trees unlike many of the more recently built course which gives the course great character. The fairways are usually pretty hard and often interspersed with weeds and bald patches but this will give you plenty of run on the ball. The greens are very slow but true and at times tough to read. There are some great views from some of the more elevated tee boxes and a Thai Temple provides the backdrop to the par-3 14th. Built in 1993 from an Isao Katsumata design concept, Sawang Resort Golf Club provides a good test for players from all tee options. Located a good 50 minutes north of Hua Hin on the road to Bangkok, this 18 hole course close to Phetchaburi offers rolling hills with a surrounding valley, with many water hazards For example you will need to be precise with your drive as their par four 17th hole plays down a fairway surrounded by water to a green surrounded by water. The layout looks like it has always been there with a mixture of water and tree lined holes. Overall Sawang is an enjoyable course that appeals to many kinds of golfers, but with a few surprises for the back-tee lower handicappers wanting some challenge from the course. The pretty setting and a well maintained layout with wisely placed water hazards make for enjoyable golf at this Hua Hin course, although the conditions here are average in keeping with other rural Thai courses. Sea Pines Golf Course is the newest arrival on the Hua Hin golfing scene and the only course with holes that run right beside the beach. We highly recommend this course which is in great condition with excellent facilities. Being virtually right on the beach, Sea Pines Golf Course is a in a stunning location and the finishing holes are particularly memorable as they are right beside the beach. The course is divided into two with holes on the other side of the railway track and offers many different challenges and will provide great enjoyment for low and high handicappers. The Springfield Royal Country Club opened its doors in 1993. 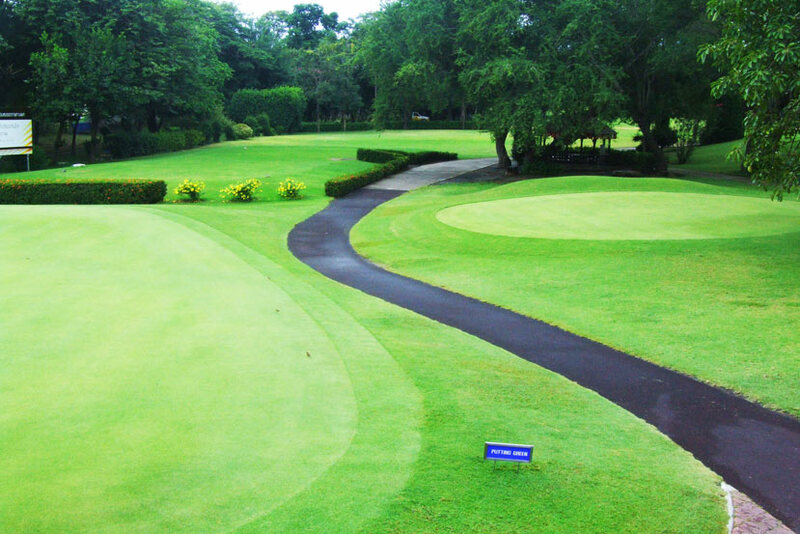 It ranks among the best golf facilities in Hua Hin province. The famous golf course designer Jack Nicklaus designed the first 18 holes; the more recently added nine holes feature a design by Lee Schmidt and Brian Curley. The three nines complement each other perfectly. The Mountain, Lake, and Valley course meet the discerning demands of a challenging championship course. Players of all handicap levels can get their money’s worth at Springfield Royal Country, with five different tees at each hole. Trees, water hazards (especially on the new course), and deep bunkers play a key role on the three courses. Every hole is different and requires a different set of golfing skills. The signature hole at the Springfield Royal Country Club is hole 18 of the Lake course. This par 5 above all favors longhitters, as it features a dogleg that leads up to an island green. The impressive and exclusive clubhouse at Springfield, with a very good restaurant, is equally splendid. The sports area includes a driving range, chipping and putting green, pro shop, as well as a professional training staff with experienced caddies. The drive from downtown Huan Hin to the marvelous facilities at Springfield Royal Country Club only takes around half an hour. 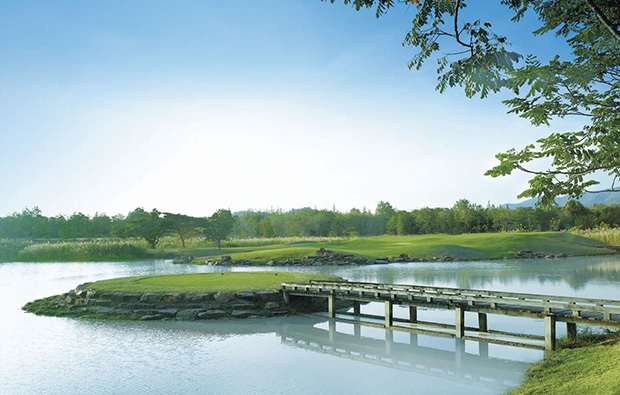 The Thai Diamond Land Kaeng Krachan golf course was first opened in 1994 and set over 27-holes, which is made up of 3x 9-holes: the Lake, the Valley and the Mountain courses that are self-explanatory. The first 18-holes were initially constructed in the beginning by the popular Thai golf course architect, Cherd Bunyaratawej. The remaining 9-holes (mountain) was designed and constructed by the prestigious Jack Nicklaus golf design team in 2008 and are an impressive addition to the club. The fairways on the main 18-hole course are surrounded by Bamboo forests, so it is important you are hitting the ball relatively straight. The main defenses of the course are the water hazards that come into play on six of the 18-holes. The Mountain Course is set over 9-holes and is 3,600 yards in length from the back tees, offering some dramatic elevations and an impressive course that really adds to the overall flavor of the club.